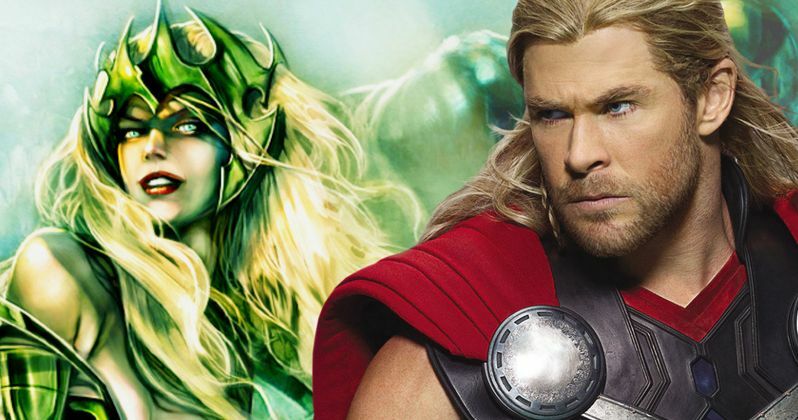 Thor 3 to Include a Female Villain, Is It Amora the Enchantress? Marvel's Phase Three is shaping up nicely, with Captain America: Civil War currently in post-production, Doctor Strange recently starting principal photography and Guardians of the Galaxy Vol. 2 in pre-production, with shooting set to begin early next year. The next project on Marvel's slate is Thor: Ragnarok, with the studio recently bringing on Taika Waititi (What We Do in the Shadows) to direct. Very little has been revealed about the story thus far, but a report from Lainey Gossip claims that the studio is eyeing a female villain for the superhero adventure, which may be Amora the Enchantress. If this does happen, it will mark the first time a female villain has appeared in the Marvel Cinematic Universe, which has often been criticized for its lack of diversity. This report has not been confirmed by the studio, and the site merely lists Amora the Enchantress as one of the possible candidates for this villain, along with Hela, Queen of the Dead. In the Marvel Comics, Hela was the daughter of Loki, portrayed by Tom Hiddleston in the Thor movies, but the studio may not include this aspect of the character if she is to enter the MCU. We reported last month that this sequel may introduce the female Marvel heroine Valkyrie, and in the comics, one of Valkyrie's enemies was none other than Amora the Enchantress. Amora debuted in the comics back in 1964, when she was sent by Thor's father Odin to eliminate Jane Foster, since Odin believed she was distracting Thor. It isn't known if this story line will be adapted in Thor: Ragnarok, but it certainly is possible, since the report regarding Valkyrie's possible involvement teased that the script by Christopher Yost and Craig Kyle is Marvel's darkest yet. All we know about Thor: Ragnarok thus far is that Chris Hemsworth and Tom Hiddleston will return as Thor and Loki, with Mark Ruffalo recently entering talks to return as Hulk. Both Thor and Hulk are said to go on a "cosmic road trip" in Thor: Ragnarok. While that story line isn't confirmed, it's worth noting that both Thor and Hulk are the only two members of the Avengers, old and new, who aren't showing up in next summer's Captain America: Civil War. This new report claims that the studio is eyeing a high-caliber actress such as Cate Blanchett for this unspecified villain role, but it isn't known if the studio has issued any formal offers yet. Marvel confirmed last month that production will begin next summer in Australia, with the studio setting a November 3, 2017 release date. What do you think about a female villain debuting in Thor: Ragnarok? Do you think it will be Amora the Enchantress or Hela, Queen of the Dead?